Letter from Henry Allen Moe, Guggenheim Memorial Foundation, to LP RE: notifying that the Biochemistry group that needs evaluation was sent by air express today. [Reply from LP to Moe February 21, 1953]. [Filed under LP Science: Box 14.015, Folder 15.1]. Thanks for your letter of 3 February. The point that you raise - that you do not feel that the equatorial spacings will be markedly altered whether one assumes seven parallel rods or six rods twisted around a central rod — is an interesting one. I would be inclined to agree with you, except for a contradictory fact. Crick has written that our expression is the first term in the complete expression for the seven-strand helical cable, which he has evaluated, and, since our expression differs from yours, the two approximate form factors do seem to be different. I am interested to learn about the work that you are carrying on. Letter from LP to Stanley Schaefer, W.H. Freeman and Company, RE: Discusses the Lewis dot structures as illustrated in the second edition of General Chemistry. 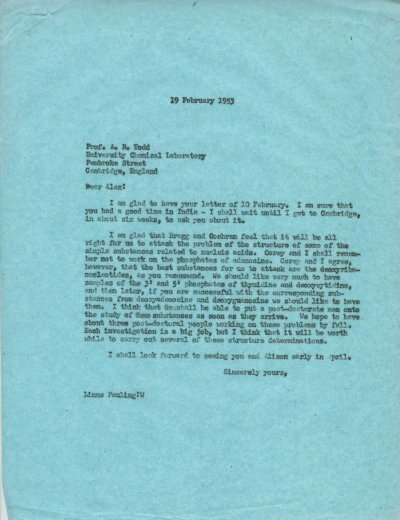 [In reply to February 9, 1953 letter from Schaefer to LP]. [Filed under LP Books: Box 1953b, Folder 1953b.1].